Why was a construction company involved in a honey bee rescue? It started last summer when NDC was hired by a Stanfordville homeowner to make some exterior repairs on a 3-story farmhouse. During our walk thru, we couldn’t help but notice honey bee activity in a main area where we were going to be working. The bees were coming in and out of a gap between the siding and the stone chimney. It was obvious they were nesting somewhere inside the house structure. For the bees’ safety and our own, the hive had to be relocated before we started any work. 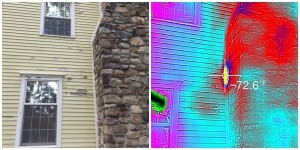 Infrared imaging taken from outside of the house revealed the colony location – behind the chimney. The homeowners hired a beekeeper with the appropriate equipment to harvest the hive, and NDC would be on hand to open up and then repair the walls. 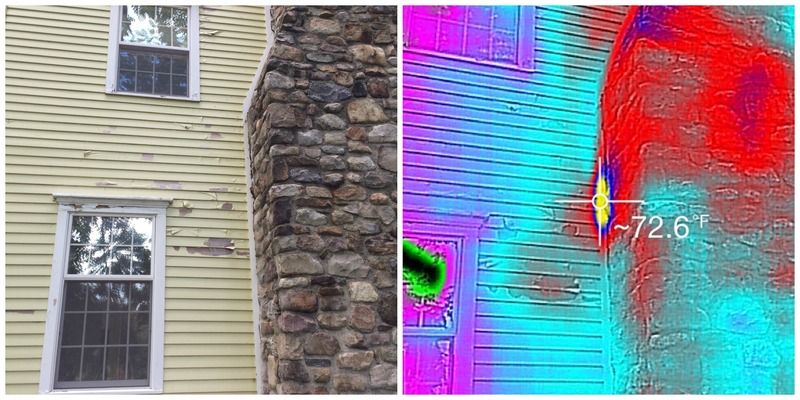 A side by side view of the house and the overlaid thermal image. The red area is where the hive was. up and cut open the siding where the bees where coming in and out. Turned out we couldn’t reach the colony that way after all, so we moved inside and wound up cutting out a 3 foot hole from an interior wall. That’s where we found the bees – thriving in an abandoned firebox. The beekeeper took the bees (and about 5 gallons of honey) and relocated the hive. NDC cleaned the masonry with hot water and bleach to remove any residual honey. This would prevent bees from returning and keep mice and insects from being attracted to the site. Our crew closed up the firebox, repaired the wall, and our painter made it look as good as new. With the relocation successfully completed, we moved on to complete the exterior repairs.